My friend, Israeli writer and public intellectual Yuval Ben-Ami set off to see what it is like to re-examine his country′s main tourist attractions with a critical native eye (all posts here), and I decided to virtually follow his path. In my blog posts I share my memories on what it was like visiting those places as an expat in Israel. This is how Yuval describes his idea, and here I describe mine (which is also Part 1 of my journey – the Western Wall). I have followed Yuval to the Baha′i Gardens (Yuval′s post and mine) and Nazareth (Yuval′s and mine). 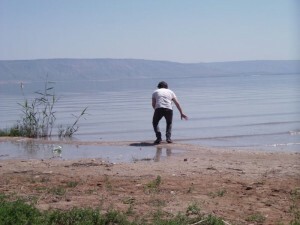 From there, Yuval moves on to Kinnereth, or the Sea of Galilee, so let′s follow him. Old Tiberias was largely demolished following the war of 1948. It was replaced with several large, mediocre hotels and a brutalistic shopping center overlooking an abandoned mosque. This isn’t the worst of it. Many beaches around the lake are privately owned and charge entry fees. 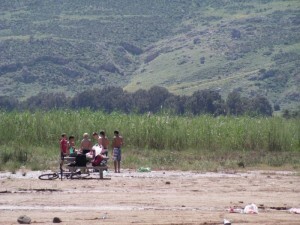 Those that aren′t, especially on the far shore, often get horrifically polluted by careless domestic vacationers. Pilgrim groups seldom see this. They are taken to carefully-maintained Christian sites on the northern shore: Tabgha, Capernaum, and the Mount of Beatitudes. From there they sail to the dock of Ginosar, which is likewise neat. This is probably best for everybody. 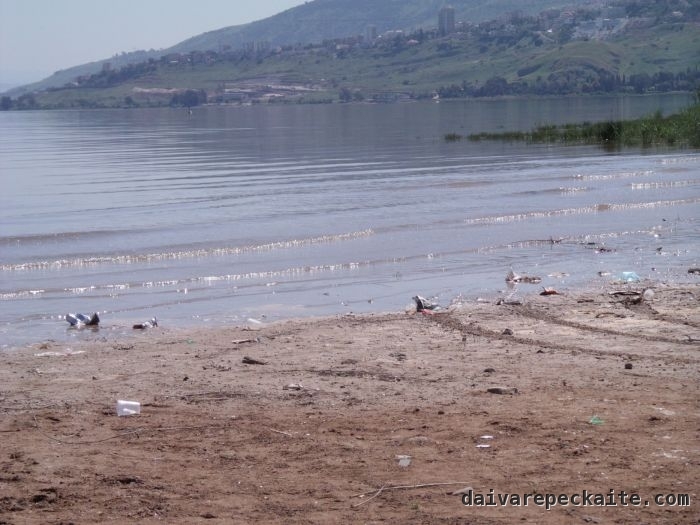 For a pilgrim from New Zealand, who talked to Yuval, Galilee was all about spiritual experience, so it is less important that the place is not stunningly beautiful or its artifacts authentic. Can my classmate try walking on water? After all, there was enough trash to jump from one pile to another. We did not have a tour bus or a guide. We did not have a guidebook or an expectation. We were not locals, for whom the area has symbolic significance as a cradle for the kibbutz movement. Nor we were tourists (see my issues with the term in my first post from the series). We were not after spiritual experience. For us this was about celebrating our youth, freedom and temporarily being in a strange place together – as if it was Erasmus. I had done it before and will do it again, as an exchange student and European intern. Traveling without a clear purpose, making up our own words and jokes, laughing, throwing ourselves into funny situations and emerging with new experience do not need pretty surroundings. We paid entrance and still found this. A native tourist could have found this upsetting. For us it was an excuse for good laughs. Cows on the road, a disappointing sight at the lake, a disappointing sight at the Paleomagnetic Field, discussing the road and sleeping in makeshift beds in a house shared by 20 people or so – these are all adventures to remember. 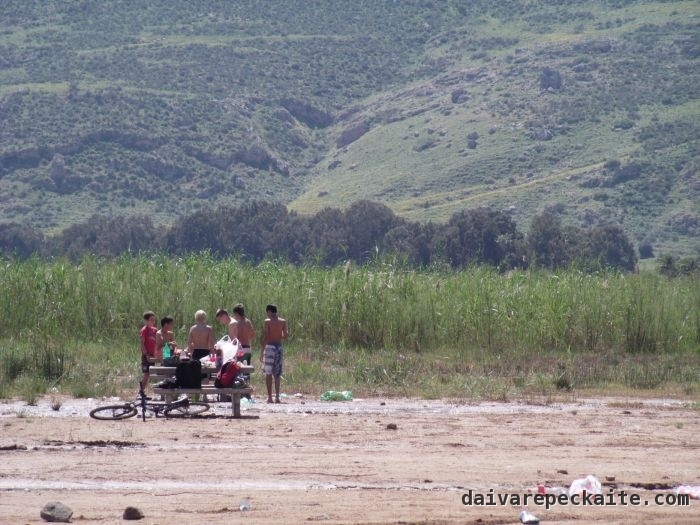 Amidst the beauty of the mountains and the ugliness of the beach, there is a group of kids. One is curiously blond and very different from the rest. Is there a story? Even if there is a story, we do not have an excuse to hear it. Some stories are hidden from us – after all, we are exp… sorry, ′tourists′ in this country.